"A Giovanna Favero ma nata Alessi. Beneaugurando. 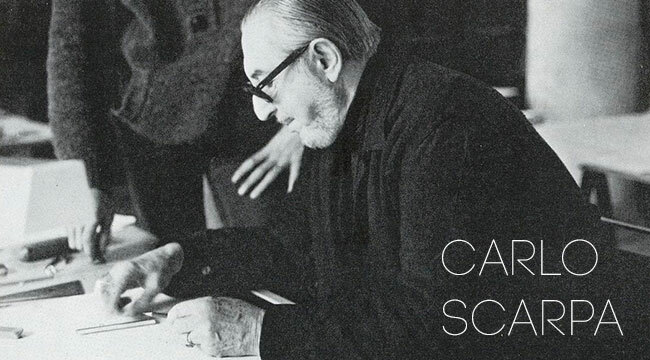 Carlo Scarpa Vicenza 4/10/77"
Alessi is a furniture trader, already owner of some important stores in the Vicenza area to which he intends to add a small shop in a corner of the strategic center of Bassano. The space itself is not particularly lucky, located on the ground floor of a building that has no formal relevance and rather narrow, especially for the exhibition of furniture. However, judging by the commercial choice of Alessi is the window, extended and facing a road trip particularly strong pedestrian. 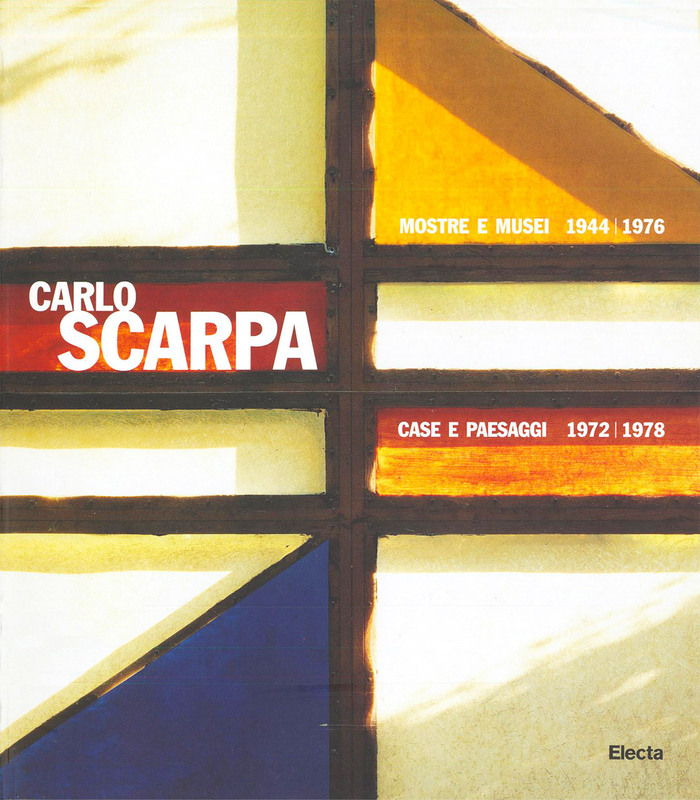 The contact with Carlo Scarpa and the commission of the project goes through Mr Gavina, former commissioner of Mr Scarpa for his own shop in Bologna. The definition of internal-external boundary is clearly the theme of the project and the design space of the window becomes the characteristic element of the whole intervention. 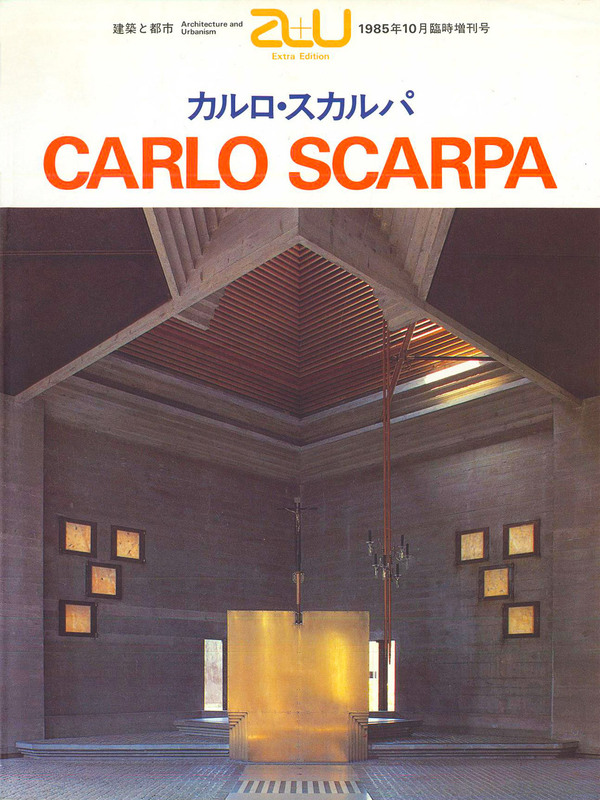 In fact, Mr Scarpa draw a curtain to trend variable with strong spatial depth, pulling back the plan of the window with respect to the existing pillars, thus creating a large glass. A further retreat of the left side allows you to put a door on the vertical pivot, increasing the feeling of depth. It will be decreased the height of the holes by dabbing the top with a sort of large continuous lintel, covered with stone pillars as well as the existing, searching a strong color contrast between the calacatta marble of the upper basalt and the stone of the lower register. 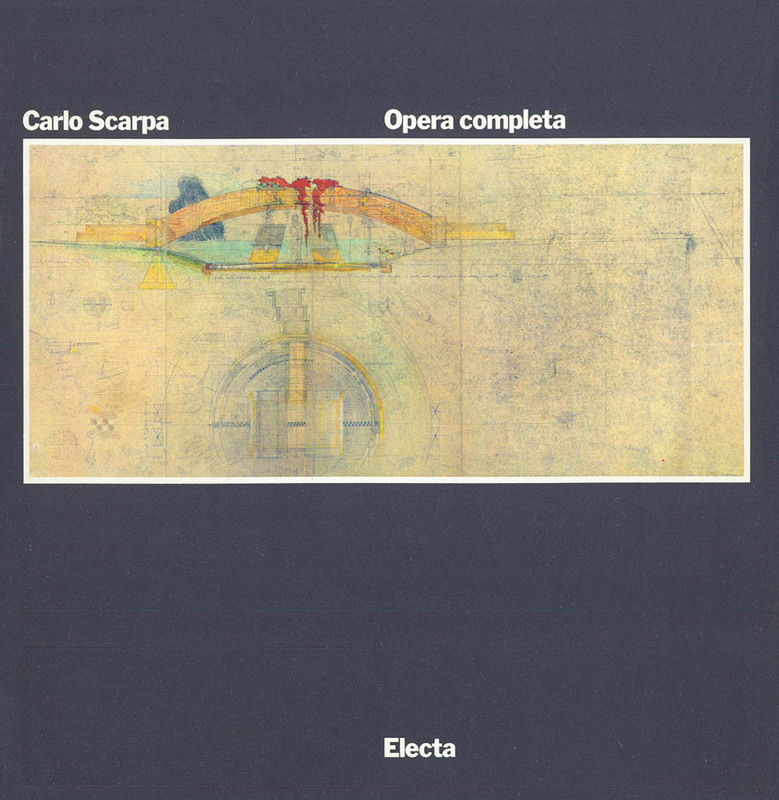 As for the interior space, at first Mr Scarpa thought to act on the big pre-existing curved wall with vertical cuts endowed with great expressive force but also with a certain drama. Then he plans to cover it with white laminate panels with the border in palisander, which allow us to give solution to the difficult relationship of the wall with the outer walls and to establish a continuity of treatment with the two blind sides of the window. 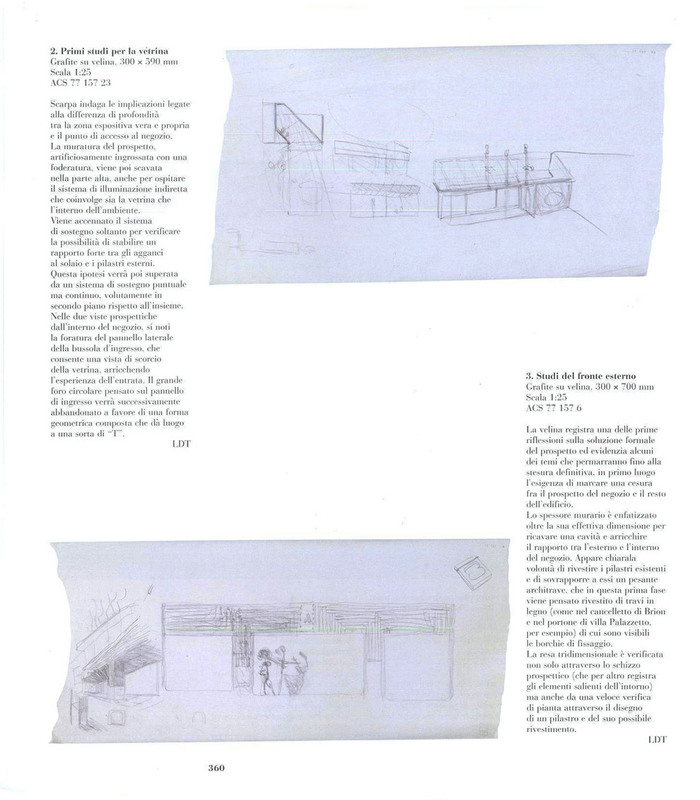 The project for the shop Alessi in Bassano is thematically close to the arrangement of the store Gavina in Bologna (1961-63), although the development of the project follows different ways. 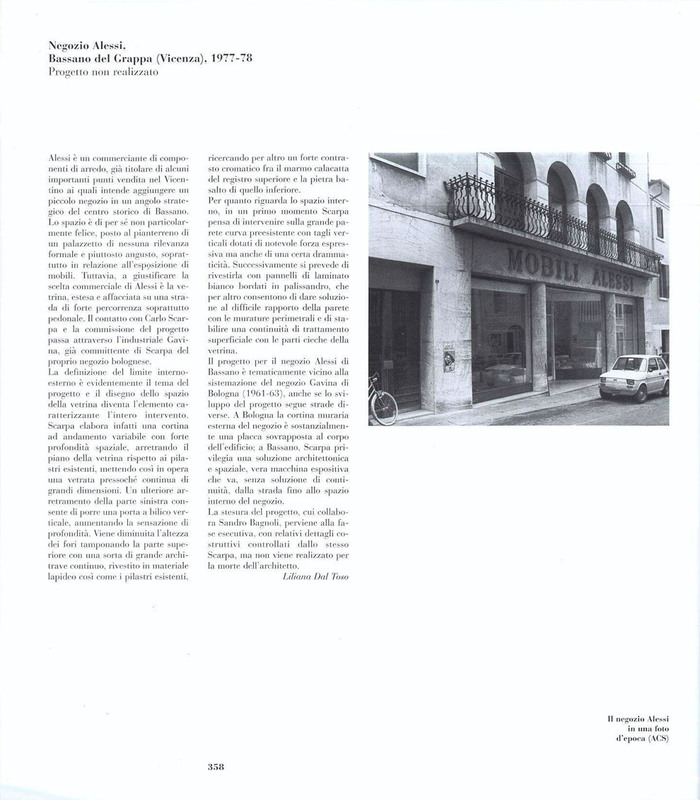 In Bologna, the outer curtain wall of the store is essentially a laid upon plate on the building; in Bassano, Mr Scarpa favors an architectural and spatial solution, which is, seamlessly, from the road up to the interior of the store. 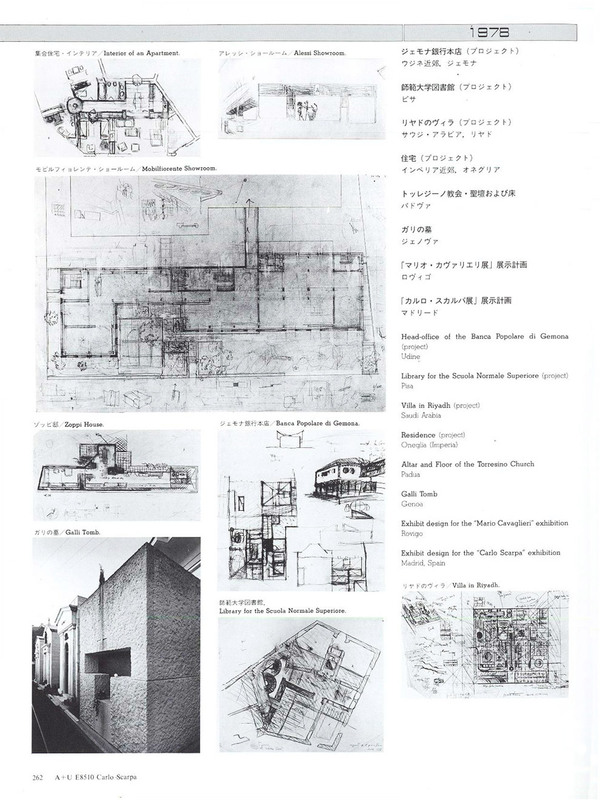 The layout of the project, whom cooperates Mr Sandro Bagnoli, comes to the execution phase, with details of construction controlled by Mr Scarpa the same, but it is not made because of the death of the architect. 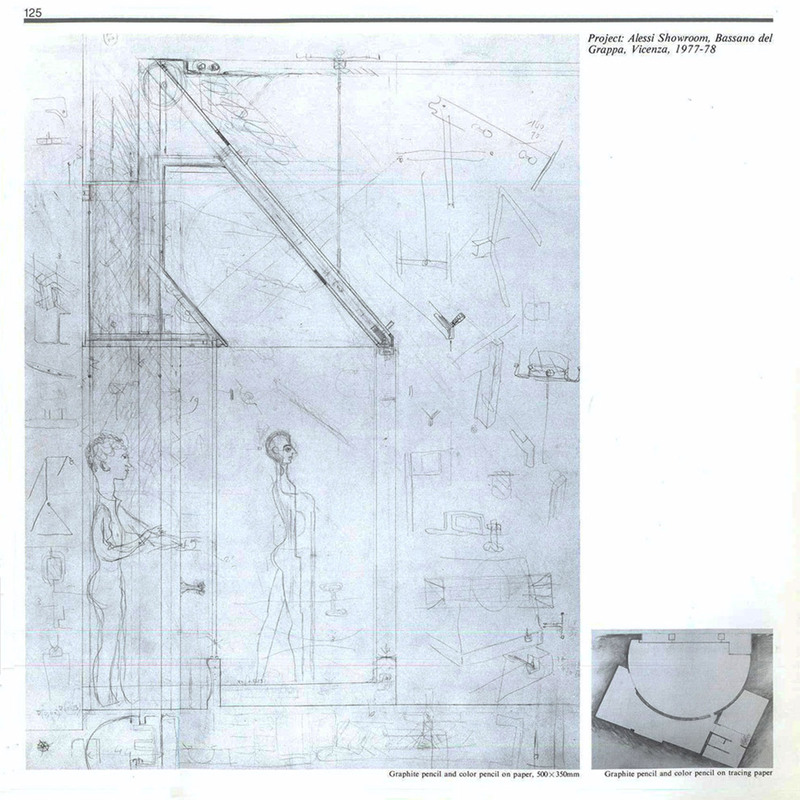 The cardboard represents the usual schedule, which traces the progress of the project: On the existing relief (applied with China diluted) later solutions are superimposed and pinned perspective sketches or studies of construction details. The solution is almost the final floor plan. 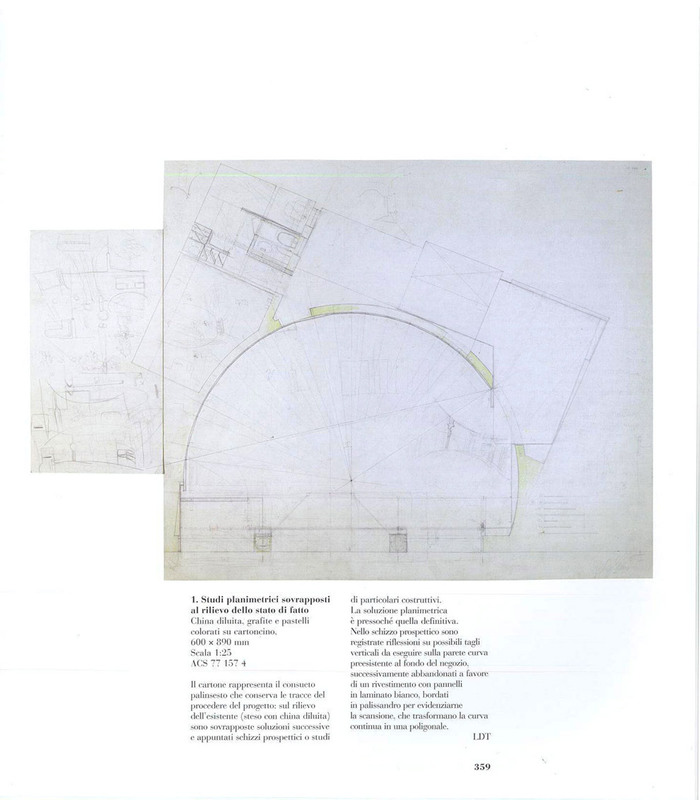 In the perspective sketch there are possible reflections on vertical cuts to be performed on the existing curved wall at the bottom of the store, then abandoned in favor of a covering with white laminate panels, edged in palisander to highlight the scan, which transform the continuous curve in a polygon. 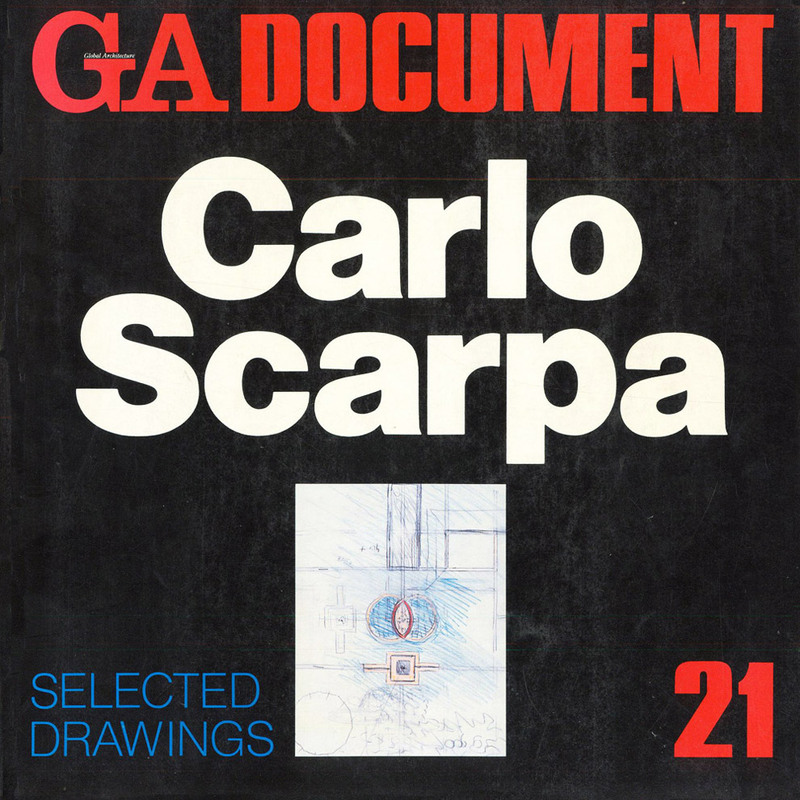 Mr Scarpa explores the implications of the difference of depth between the exhibition itself and the access point to the store. The masonry of the facade, artificially thickened with a lining is then carved into the top, even to give space to the indirect lighting system that involves both the window and the inside of environment. It is mentioned the support system only to check the possibility of establishing a strong relationship between the hooks to the ceiling and pillars outside. This hypothesis will be passed by a support system punctual , but continuous, deliberately in a second place respect to the whole. In the two perspective views from the interior of the store, you will notice the holes in the side panel of the compass’ s entrance, which allows a view in perspective of the window, enriching the experience of’ entry. The large circular hole on the entry panel will be later abandoned in favor of a geometric composed shape that gives rise to a “T”. The tissue has one of the first reflections on the formal solution of the prospectus and highlights some of the themes that will persist until the final draft, first of all the ‘need to mark a break between the prospectus of the shop and the rest of the building. The thickness of the wall is emphasized more than its actual size in order to obtain a cavity and enrich the relationship between the ‘external’ and the interior of the shop. 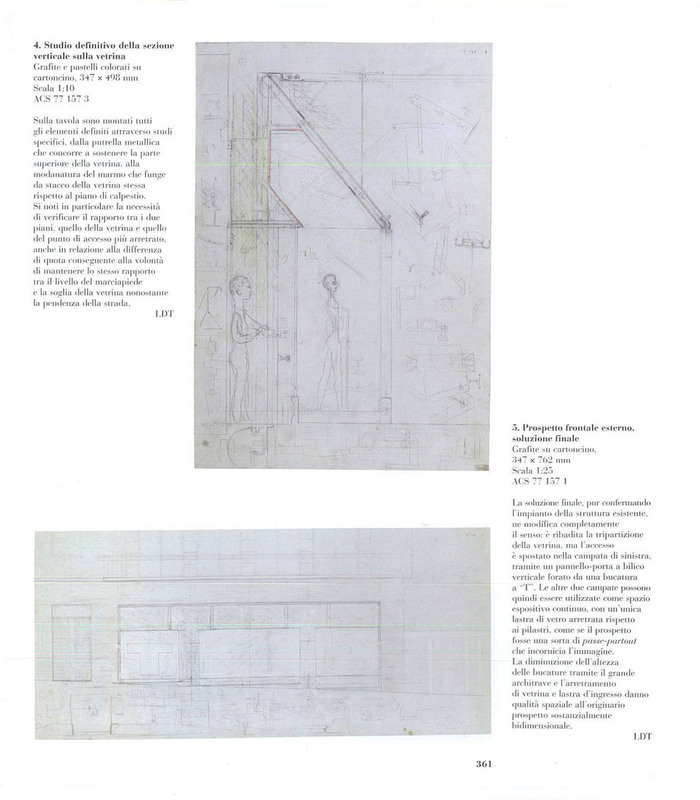 It is clear the desire to cover the existing pillars and to overlap to them a heavy lintel, that in this first phase is thought to be covered by wooden beams (as in Brion’ s gate and the door of Villa Pazzetto, for example) where mounting studs are visible. 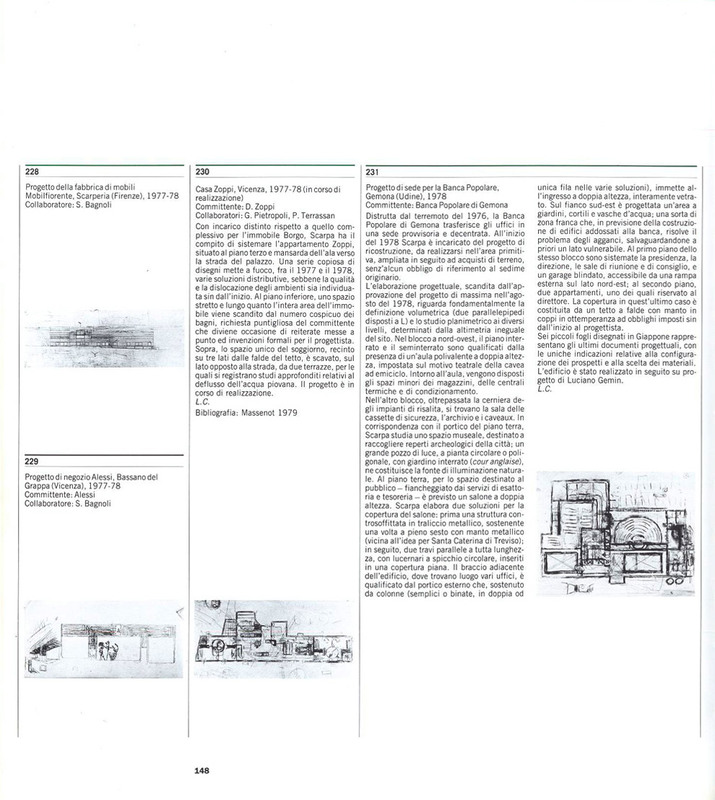 The three-dimensional rendering has occurred not only through the perspective sketch (which otherwise records the highlights of the around) but also by a quick verification of the plant through the design of a pillar and its possible covering. On the table are mounted all the elements defined through specific studies, the metal beam that helps to support the top of the window and, the molding of marble that serves as out of the window respect to the ground floor. You note in particular the need to verify the relationship between the two floors, the one of the window and that of rearmost point of access, even in relation to the height difference resulting from the desire to maintain the same relation between the level of the sidewalk and the threshold of the window despite the inclination of the street. The final solution, while confirming the plant of the existing structure, it completely changes the sense: it is repeated, the original division of the window, but the access is moved to left field, through a vertical door panel perforated by a T punch. The other two bays can then be used as continuous exhibition space with a single panel of glass lagging behind pillars, as if the prospect was a kind of passe-partout that frames the image. The decrease of the height of the openings through the great lintel and the retreat of the window and of the entrance give spatial quality to original two-dimensional statement.